« My procedure for roasting coffee with a popcorn popper and a gas burner. Adventures in DIY coffee roasting - The Whirley-Pop! So there I was, cleaning out my kitchen. Way in the back of an under-the-counter cabinet, I found it. It had been a wedding present from a dear friend. Mrs. Zennmaster and I had been married for over ten years. When it was new, it came with a brick of orange butter/oil/grease and a special bag of unpopped kernels. We used it once, then it began its journey that ended up in the cabinet. When I found it, I got excited. I wasn’t thinking at all about popcorn, though, it’s been years since I’ve seen popcorn that didn’t come from the microwave. No, I wasn’t thinking popcorn, I was thinking coffee. My DIY Coffee Roasting setup. 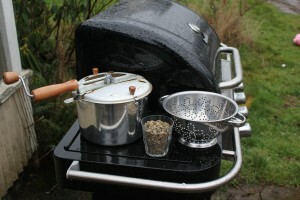 A crank-style stovetop popcorn popper, a gas grill with a side burner, a nondescript colander, and some green coffee beans. I remembered, over the years, hearing that you could use one of these things to roast coffee. Being a firm believer that anything you can DIY is better than anything you can’t, I was totally inspired. Maybe this was how I’d achieve the perfect shot, the perfect cup! I mulled this over for a few days. Like most of us do anymore, I went looking on-line for some hints, tips and tricks. What I found wasn’t exactly encouraging. It seemed that consistency, accuracy and quality were all things that weren’t supposed to be found in stove-top roasting. For that, you’d need to use another approach. This might be as simple and low-tech as using an old air popcorn popper, up through spending several thousand dollars on a real live commercial roaster. I found myself a little disappointed, and a little discouraged. I felt like my simple setup was going to have to get awfully complicated before I would meet with any success at all. Even so, I made the jaunt to Mr. Greenbeans on the North side of town. I walked away with 5 pounds of green beans, including one variety that was described as “Forgiving”. That sounded pretty good! After a few more minutes of agonizing over on-line tutorials, and trying to figure out where I could get a 550 degree thermometer before I had to skip town again, I just said to myself “Screw it!”. I went out to my grill, fired up the external burner, and waited for things to heat up. I had pretty much just decided that I didn’t care if I destroyed a pound or two of beans while trying to gather some baseline data. I knew the popper had to be hot before I put the beans in, or they would bake rather than roast, and that would not lead to the perfect shot or the perfect cup. So I waited. Finally, I figured it had to be hot enough. Much more, and I would start to worry that the aluminum would start to melt. So in went the beans, and I started cranking for all I was worth. As promised, the smells came first. It was a thick, earthy, vegetable smell, but it was unmistakably the smell of something roasting. My popper has a window, so I looked in and saw the beans taking on a tan-ish color. I kept spinning the beans, and eventually heard the “First Crack”, which sounded pretty much like popcorn popping. That lasted only a few seconds, then the beans quieted down. 30 seconds or so later, the “Second Crack” came along, which is really more of a “Sizzle” than an actual “crack”. From my research, I knew this was the time to start thinking about how I would be bringing this process to a stop. I grabbed my colander and dumped the beans. The rich, thick, delicious smelling smoke billowed out of the popper as a lovely batch of dark brown coffee beans rattled into the colander. I swirled and tossed them around, doing my best to get some cool air around them to stop the roast. By the time the dust had settled and the smoke cleared, I had roasted a batch of coffee beans! That first batch wasn’t at all bad. I had been trying for a medium-ish roast, but ended up with something a little darker than I was expecting. This was not disappointing, as I tend to be a dark-roast kind of guy. The most important lesson I took away from that first batch (and the half dozen or so batches that followed), is not to be intimidated or scared of the process. Just jump in and do it, then see what you would like to do better next time. I found that it’s actually much easier to under roast than it is to over roast. There is so much smoke, and the smell will really tell you you’re about to overdo it, that I feel like I’d almost have to walk away to really burn the beans. On the other hand, in trying to go light, I found it very easy to end up with something that would choke my grinder and tasted like stewed lawn clippings.